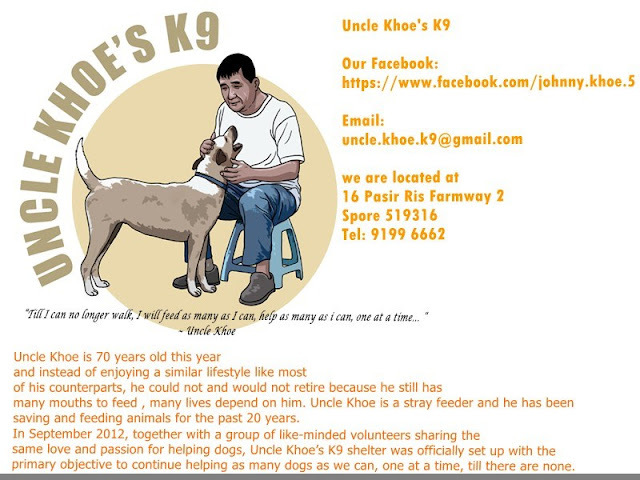 We are a small grain of sand among the desert..
Uncle Khoe's K9 is not a registered charity nor recognized welfare group the maintenance of our shelter goes solely by contributions from our key volunteers. We do not have fancy posters, logo or blog as all these are main by volunteers who have other roles in their lives and we do not have huge resources.. Currently our shelter have 22 dogs and efforts to re-home breeding dogs, saving industrial mongrel puppies and feeding industrial dogs is still ongoing every day without fail, we do not huge publicised what we do, as again we do not have the time to update our blog and also the key mantra of Uncle and our leader volunteer H is we do things in a very traditional, silent way..Still our spirit and faith to re home our shelter residents and numerous canines that needs our help remains strong! Below is the flyers that we will distribute at the booth. 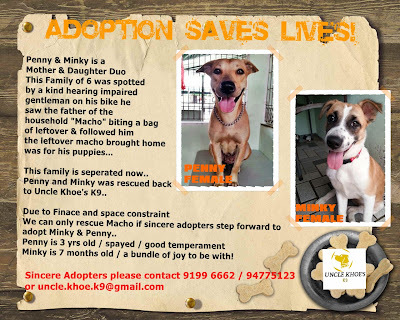 Is been a while since our last update..we have been busy leading the mundane day to day life and of cos our regular feedings and rescue..
Uncle have been busy too, he just had his birthday well spent in March with all your kind wishes and his dogs of cos! The volunteers have also pop him a surprise visit with twelve cupcakes, and for the first time Uncle finally agreed to appear in the limelight that he has usually shone away, he appear on RAZOR TV! yes he is now officially a star !! we are also very glad that our young volunteer Ellysya who has been volunteering with us since 2012 regardless of rain and shine, amidst her horrible allergic reaction towards dog's saliva and fur, and travelling a long distance from her boarding home west to east. she has brave all odds to come to the shelter every weekend..
she has recently given a speech to a grand audience of an account of her own thoughts and feelings of volunteering at dog shelters, here below is an extract of her speech she delivered last week in Republic Polytechnic. If you Google ‘How to have a more fulfilling pace of life in Singapore’, the first few results will be pertaining to the Singapore Conversation. But I’m not here to talk to you about what a fulfilling life should be or even how you should lead your life, I’m here to share with you about my journey in search of my passion. Good morning Mr Heng Swee Keat, Mr Wong, teachers and fellow representatives from the respective schools. I am Ellysya Lee and just like most of you, I am an ordinary secondary school student. I am Sec 4 this year and I’m from CHIJ St Nicholas Girls’ School. I am the president of my CCA, Infant Jesus Youth Mission (IJYM) which is a service learning club. Like what Mr Farhan asked you, what is your version of a ‘fulfilling life’? Honestly speaking, I can’t exactly answer that question either. But my theory is, follow your passion, live well, laugh often and love more. I guess at this stage, some of you may have already planned your path which leads to becoming a doctor or even a lawyer. As for myself, I’ve had so many different aspirations ever since Primary School. From an artist to a scientist, from a sewage cleaner to the president of a country and then I realized at a point of time that I’m neither artistically nor scientifically inclined so I told my dad that I would just become a rubbish-woman. But now, I dare say that my future job will be something related to helping the less fortunate, be it humans or animals. In my sharing today, I will talk about my experiences following my passion and the challenges that I have faced. For the past year, I have been an active volunteer at an animal shelter and in my church. I am also involved in CSM 2013 which is held by Voluntarius (Singapore), a non-profit organisation which aims to promote volunteerism among youths in Singapore and my focus today will be on my experience at the shelter and in my CCA. Being in IJYM marked the start of my volunteering journey. It exposed me to the various volunteering opportunities and we worked closely with our mission, Bringing Joy Through Service. Two years later, I became the President of the club. Being the president of a service learning club is certainly not an easy task. We go through a lot being in charge of a CCA. All the hard work we put in day after day, the many sleepless nights spent thinking about CCA, and all the sacrifices that we make to ensure things work, which sadly, may not necessarily pay or even get the slightest bit of appreciation. But I tell myself, “Don’t strive on compliments, don’t stop doing what you’re supposed to do, pluck up the courage and stay on.” Because to me, courage doesn't always roar. Sometimes courage is the little voice at the end of the day that says I'll try again tomorrow. On better days, things would run smoothly as planned and nothing major would crop up; on not-so-good days, everything starts going wrong, nothing is going as planned, and sometimes, even dropping a pen would make me feel like why is the entire world going against me. But what prompted me to persevere was really my friends and Exco members who continued supporting me throughout the entire journey and up till now, two of them are seated amongst you today. Moving on, I am going to talk about my shelter experience. 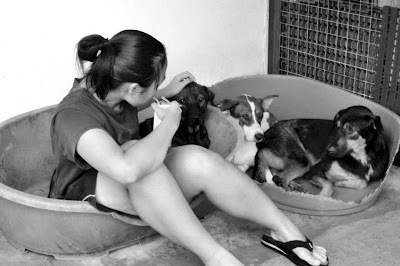 My first visit to the shelter was on the 7th of January 2012. 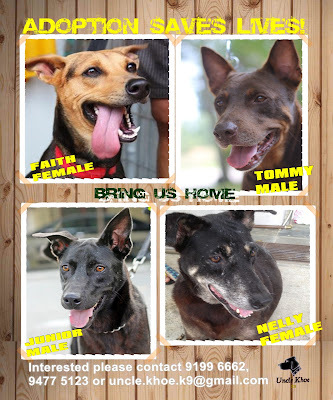 After my first visit, I started going to the shelter regularly on Saturdays, usually from 2pm to 5pm but before I knew it, I started going earlier and ending later! On a normal day, I clean the kennels, bring them out for walks, bathe them, feed strays, try to find homes for them and go out on rescue missions, it’s all hard labour work. Volunteers often go back home with backaches and sunburns, but at the end of the day, we’d all go to bed thinking, wow, what a well-spent day. Even though it takes me up to 2 hours to get to the shelter, even though I get so tired at the end of the day, even though I get so busy or caught up with other things at times, I still go back to the shelter week after week. More often than not, I feel that they’re the ones helping me more as compared to me helping them. They’re the ones who’re teaching me that we have to take breaks in life, enjoy the sun and go for a long walk. Through the shelter, I've also learnt about the plight of the strays and especially dogs kept in captivity in breeding farms. For 5 years of their lives before they retire, they don't experience human touch or love, they don't get to step out of their cages and they don't even get to bathe! When their 5 years are up, they are then discarded. Some gets released into the streets, others will get euthanised, that's where we as volunteers step in. They're treated like breeding machines, manufacturing puppies for the sole purpose of making profits for humans. It's unfair, but it is the reality. So next time when you walk into a petshop and you see all those adorable puppies staring at you waiting for you to take them home, please think about what their parents had to go through to fuel the industry. If you think that looking at dogs and puppies kept captive in a cage is pitiful, how would they feel looking out of the cage? When people ask me why do I bother volunteering at the shelter, I always tell them it is solely because I love dogs so much and because they’re the ones pushing me forward in life. It’s really about building a personal relationship with each dog at the shelter which would really make every visit count. Every time I visit the shelter, our relationship grows stronger, they trust me more and I become more confident around them. 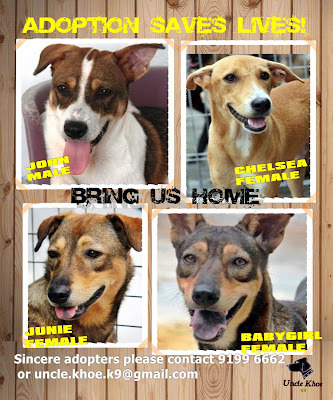 At times when I feel down or caught up with something else, the shelter dogs would somehow sense it and some of them would come and nudge me continuously until I play with them, some would just lie down by my side and rest their head on my leg, some would rest their front legs on my shoulder and lick my face. Their endless supply of love never ceases to amaze me. It’s a long, tough and emotional journey, but ever so enriching and touching when dogs get adopted into wonderful homes. It’s really amazing how I always go back to the shelter and spend time with them. Even though I do the same things over and over again, the experiences that I get are never the same. Up till now, I still look forward to going to the shelter every weekend. The dogs are the force driving me to persevere each weekday until the weekend is here where I’ll get my reward at the shelter – licks on my face and the sight of them wagging their tails so vigorously. All those amazing furry souls out there will never fail to let me fall in love with them again and again. Remember that good things come in threes, but so do bad things. There are days when I feel like nothing is going right, when CCA is not productive, when day is too hot, the sun is too bright, the rain is too heavy, people are talking too loudly, on days when every single thing annoys me, on days when I feel like I'm the most worthless person one could ever be. I vividly remember there was once during CCA when I felt like nothing is going right, I'm such a lousy President, why is no one listening to me. All those negative thoughts came plunging at me. I'm sure most, if not all, of you seated here today will understand the feeling of when you're already feeling so horrible, life then starts picking at you further, digging deeper into the wounds and sometimes letting you lay so helplessly by the crossroads. 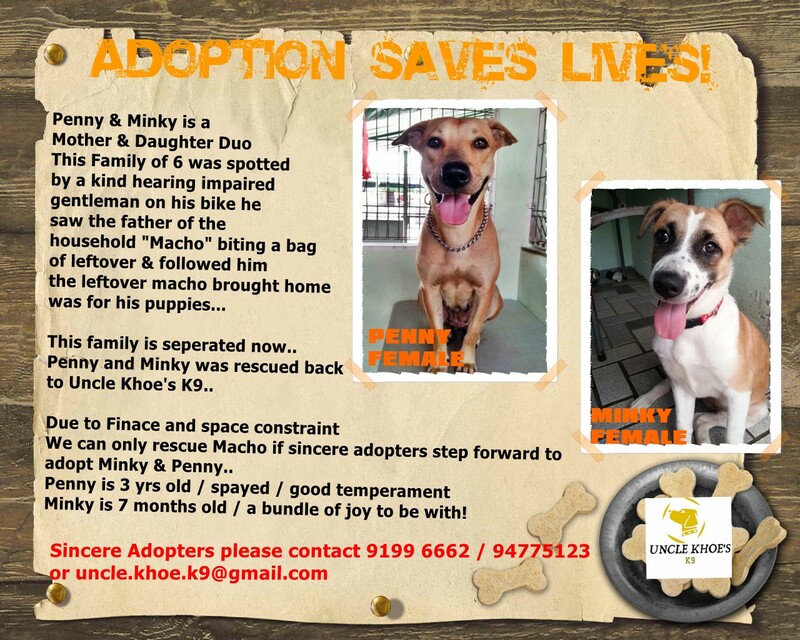 At times like this, I make my way to the shelter where my dogs will never fail to get everything off my mind and I always feel better after going to the shelter. Recently, I’ve also joined CSM 2013 and I am in VM sub-committee. When I first joined the committee, I felt a little out of place because I am one of the youngest members there. But as I got to know my other committee members better, I realised that they are one fun bunch and we’re all working towards a common and focused goal. Presenting to you, CSM VM! Do check out our booth outside the hall to find out more! As a volunteer, I think that it is essential to have a set of core values and concepts which you hold close to your heart. Firstly and most importantly, the concept of servant leadership. Servant leadership basically means that we always put others before self because I believe that as leaders, we are called to serve and not dictate. Being able to empathise is another important value. Empathy is putting oneself in another's shoes and feeling for that person instead of just pitying the person. It is important that we, as leaders, relate to people who are seeking our help. Last but not least, always always take the initiative. Volunteering is about stepping out of your comfort zone and we have to remember to always take the initiative to do a good deed. I call my volunteering experience a journey of love. Just like close friends, you need patience, trust, tolerance and a whole lot of faith to maintain the relationship. It goes the same for volunteering, you're always going to meet people who'd try to knock you down, but what matters most is the patience and understanding. To conclude, my sense of a fulfilling life is a life in which I am able to do things I like and I believe that my passion lies in volunteering because I feel that we are all put on this earth to complement each other. Someone who is successful may not necessarily have a fulfilling life, but someone who has a fulfilling life is definitely successful in such a way that they’ve enjoyed their life and made the most out of it. After everything that I have said, some of you may think that I find happiness volunteering at the shelter. But the fact is, I’m not. 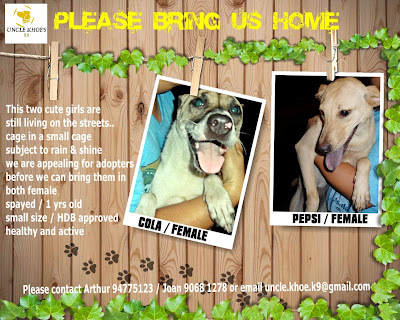 I feel turned off by the fact that there is a need for shelters because of the animal abuse and abandonment cases. I’ve seen people abusing their dogs so badly that I actually cried. Volunteering is a way of life, it can just be as simple as smiling at a stranger. So be the best leader of yourself and don’t stop volunteering because it is not only about helping, it’s also about willingness. Like what Batman said in The Dark Knight Rises, 'A hero can be anyone. Even a man doing something as simple and reassuring as putting a coat around a young boy's shoulders to let him know that the world hadn't ended.' In the end, to be yourself in a world that is constantly trying to make you something else is the greatest accomplishment one can ever achieve. I have found my passion, so I urge you to think about how does the road to your heart look like because the road to my heart is paved with pawprints. This blog and its content are provided ‘as is’. This disclaimer and the rules below apply to this blog. 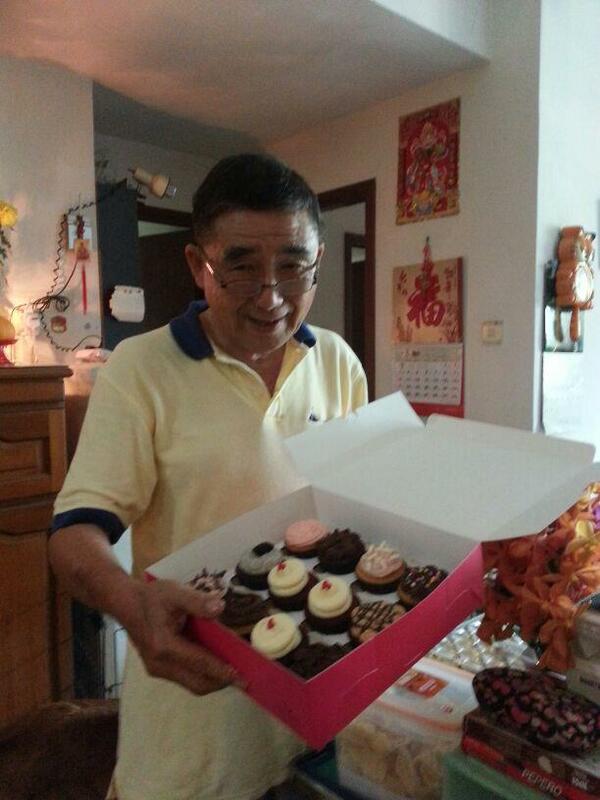 Uncle Khoe's K9 can change these provisions without preliminary notice. If you do not agree with these provisions, please do not use or read this blog. Consult this disclaimer regularly to be informed about any possible changes. Using this blog after changes have been made to the provisions shall be considered approval of these provisions. The content of this blog is for informative purposes only. The owner of the blog cannot be held liable for the completeness or the accuracy of content on this blog or on websites that refer to this blog. The owner cannot be held liable for mistakes or omissions in the information or for the availability of the information. The owner cannot be held liable for any loss, injury or damage resulting from publication or reliance on this information.